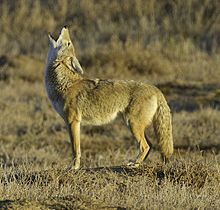 The Coyote (from Nahuatl coyōtl pronunciation (help·info)) or prairie wolf, Canis latrans, is a canine native to North America. 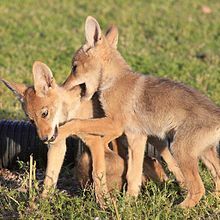 It is smaller than its close relative, the gray wolf, and slightly smaller than the closely related eastern wolf and red wolf. It fills much of the same ecological niche as the golden jackal does in Eurasia, though it is larger and more predatory, and is sometimes called the American jackal by zoologists. 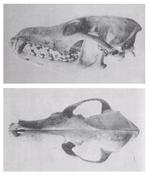 Lawrence and Bossert, 1969 It is a hybrid of C. lupus and C. latrans, smaller than the eastern wolf and holds smaller territories, but is larger and holds more extensive home ranges than the typical western coyote. It ranges in New England, New York, New Jersey, Pennsylvania, Ohio, West Virginia, Maryland, Delaware, and Virginia. 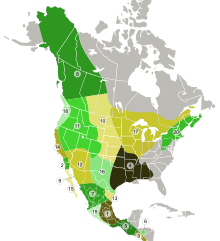 It also ranges in the eastern Canadian provinces of Ontario, Quebec, New Brunswick, Nova Scotia, Prince Edward Island, and Newfoundland and Labrador. 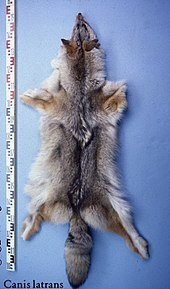 ^ "Canis latrans". 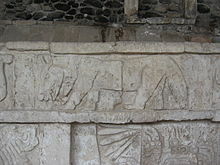 Fossilworks.org. Retrieved September 5, 2016. ^ a b Mussulman, Joseph (November 2004). "Coyote". Discovering Lewis & Clark. Retrieved January 15, 2013. ^ Mussulman, Joseph (November 2004). "Thomas Say: Canis latrans". Discovering Lewis & Clark. Retrieved January 15, 2013. ^ a b c d e f g h i j k l Gier, H.T. (1974). 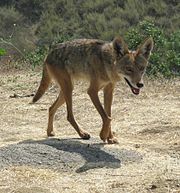 "Ecology and Behavior of the Coyote (Canis latrans)". In Fox, M. W. (ed.). 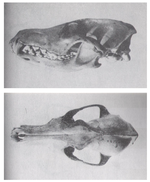 The Wild Canids: Their systematics, behavioral ecology, and evolution. New York: Van Nostrand Reinhold. pp. 247–262. ISBN 978-0-442-22430-1. OCLC 1093505. ^ a b c d e f g Bekoff, Marc; Gese, Eric M. (2003). "Coyote". In Feldhamer, George A.; Thompson, Bruce C.; Chapman, Joseph A. (eds.). Wild Mammals of North America: Biology, Management, and Conservation (2nd ed.). Baltimore, Maryland: Johns Hopkins University Press. pp. 467–470. ISBN 978-0-8018-7416-1. OCLC 51969059. ^ a b Lehner, Philip N. (1978). "Coyote Communication". In Bekoff, M. (ed.). Coyotes: Biology, Behavior, and Management. New York: Academic Press. pp. 127–162. ISBN 978-1-930665-42-2. OCLC 52626838. ^ Bright, William; Gehr, Susan. "Coyote". Karuk Dictionary and Texts. Karuk Tribe & UC Berkeley. Retrieved May 22, 2015. ^ "Coyote". Yurok Language Project. UC Berkeley. Retrieved May 22, 2015. ^ a b c Koepfli, K.-P.; Pollinger, J.; Godinho, R.; Robinson, J.; Lea, A.; Hendricks, S.; Schweizer, R. M.; Thalmann, O.; Silva, P.; Fan, Z.; Yurchenko, A. A.; Dobrynin, P.; Makunin, A.; Cahill, J. A.; Shapiro, B.; Álvares, F.; Brito, J. C.; Geffen, E.; Leonard, J. A.; Helgen, K. M.; Johnson, W. E.; O'Brien, S. J.; Van Valkenburgh, B.; Wayne, R. K. (August 17, 2015). "Genome-wide Evidence Reveals that African and Eurasian Golden Jackals Are Distinct Species". Current Biology. 25 (16): 2158–65. doi:10.1016/j.cub.2015.06.060. PMID 26234211. 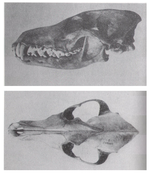 ^ "Canis lepophagus". Fossilworks. Retrieved July 11, 2016. ^ Nowak, R. M. (2003). 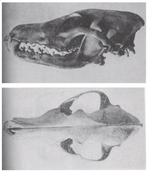 "Wolf evolution and taxonomy". In Mech, L. David; Boitani, Luigi (eds.). Wolves: Behaviour, Ecology and Conservation. University of Chicago Press. pp. 239–258. ISBN 978-0-226-51696-7. ^ Nowak, R. M. (1978). 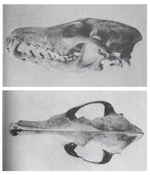 "Evolution and taxonomy of coyotes and related Canis". In Bekoff, M. (ed.). 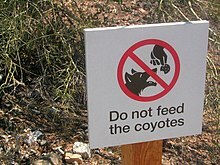 Coyotes: Biology, Behavior, and Management. New York: Academic Press. pp. 3–16. ISBN 978-1-930665-42-2. OCLC 52626838. ^ Wozencraft, W.C. (2005). "Order Carnivora". In Wilson, D.E. ; Reeder, D.M (eds.). Mammal Species of the World: A Taxonomic and Geographic Reference (3rd ed.). Johns Hopkins University Press. pp. 532–628. ISBN 978-0-8018-8221-0. OCLC 62265494. ^ a b c d e f g h i j k l m n o p q r s Nowak, Ronald M. (1979). "History and Statistical Analysis of Recent Populations". In Wiley, E. O. (ed.). 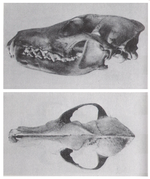 North American Quaternary Canis. Lawrence, Kansas: University of Kansas Printing Service. pp. 9–10. ^ Hilton, Henry (1978). 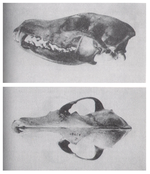 "Systematics and Ecology of the Eastern Coyote". In Bekoff, M. (ed.). 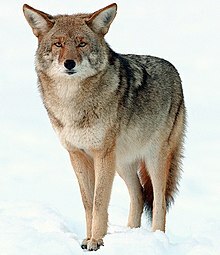 Coyotes: Biology, Behavior, and Management. New York: Academic Press. pp. 210–28. ISBN 978-1-930665-42-2. 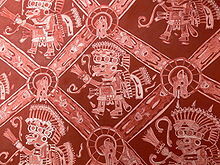 OCLC 52626838. ^ Asa, C. S.; Mech, D. (1995). 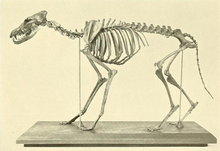 "A review of the sensory organs in wolves and their importance to life history". In Carbyn, L. D.; Fritts, S. H.; Seip, D. R. (eds.). Ecology and Conservation of Wolves in a Changing World. Edmonton, Alberta: University of Alberta. pp. 287–291. ISBN 978-0-919058-92-7. OCLC 35162905. ^ "Mammals Go Nocturnal in Bid to Avoid Humans". Retrieved June 21, 2018. ^ Stains, H. J. (1974). 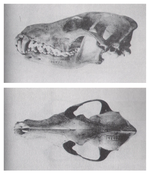 "Distribution and Taxonomy of the Canidae". In Fox, M. W. (ed.). 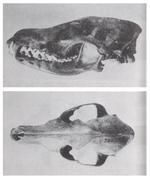 The Wild Canids: Their Systematics, Behavioral Ecology, and Evolution. New York: Van Nostrand Reinhold. pp. 3–26. ISBN 978-0-442-22430-1. OCLC 1093505. ^ Bushkirk, S. W.; Ruggiero, L. F.; Krebs, C. J. (2000). "Habitat Fragmentation and Interspecific Competition: Implications for Lynx Conservation" (PDF). In Ruggiero, L. F.; Aubry, K. B.; Buskirk, S. W.; Koehler, G. M.; Krebs, C. J.; McKelvey, K. S.; Squires, J. R. (eds.). 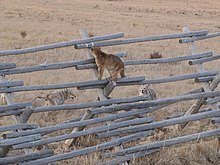 Ecology and conservation of lynx in the United States. Denver: University of Colorado Press. pp. 91–92. 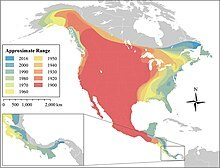 ^ "Coyotes Conquered North America. Now They're Heading South". The New York Times. May 24, 2018. ISSN 0362-4331. Retrieved May 25, 2018. ^ a b Gier, H. T.; Kruckenberg, S. M.; Marler, R. J. (1978). 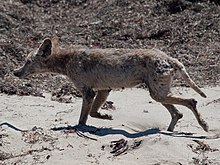 "Parasites and diseases of coyotes". In Bekoff, M. (ed.). Coyotes: biology, behavior, and management. New York: Academic Press. pp. 37–71. ISBN 978-1-930665-42-2. OCLC 52626838. ^ Grandin, Temple (February 26, 2015). "Experts say ranching done right improves the environment and wildlife habitat". Beef Magazine. Retrieved December 30, 2017. ^ "Bred Cows, Bred Heifers, Feeder Calves". Rhino's Beef & Farm Raised Aussies. October 4, 2016. Retrieved December 30, 2017.